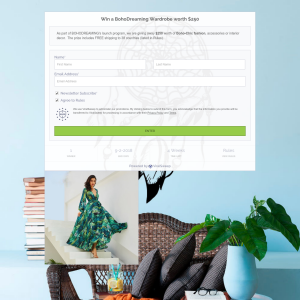 As part of BOHODREAMING's launch program, we are giving away $250 worth of Boho-Chic fashion, accessories or interior decor. The prize includes FREE shipping to 38 countries (listed in Rules). 1. You must sign up for BohoDreaming's Newsletter (we only mail out periodically with discounts and new items so do not spam). 2. You must take part in at least one social action to enter into this prize draw. 3. It is your choice of products to the value of $250. Free Shipping is available for the 38 countries listed below. 4. Entries close midnight on 2 September 2018. 5. The winner will be drawn and announced on 3 September 2018.